These Forests and the Bear Population Deserve Protection. Help Us Today! 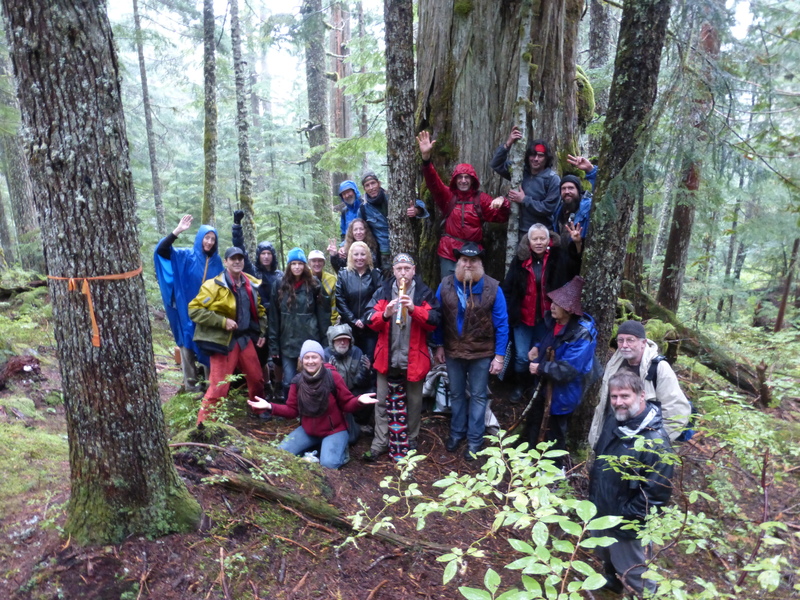 On October 5th, a group of concerned citizens met off Sunshine Coast Hwy 101 (near Roberts Creek) to venture out on a trial into the nearby old-growth forests of Dakota Bowl. It was clear on the Coast, however when we turned down in the Bowl the rain clouds opened up. Included in the group were shishalh Hereditary Elder (81 yrs old!) Xwu‘p’a’lich (Barb Higgins)(seen here wearing a cedar hat), Hereditary Chief and Rememberer of the Shishalh Nation, a Sto:lo activist, Patricia Kelly, who was instrumental in winning a Supreme Court case on an Aboriginal fishing issue (above Barb), Tim and Thilo, musicians the group B.E.A.R (center) and a Los Angeles based-producer (blue toque on the left) doing documentaries on animal rights issues. Even though these lands are on traditional Squamish 1st Nation territory, Barb Higgins reminded us that no treaty has been settled between the Province and Squamish. On that topic: Chief Bill Williams of Squamish has been contacted by his long-time associate Shel Neufeld of Roberts Creek. Shel informed Chief Williams that these forests show high black bear use. Chief Bill would like more information on the number of den sites when that research is completed. When a potential den site was shown to the group, discussion was generated regarding the wisdom of cutting down trees (and the surrounding habitat) that provide homes to female bears and cubs, vs. the tree being used as timber and turned into a commodity. Questions of why old-growth cedar is being targeted, over ‘harvesting’ cedar from 2nd growth tree farms was raised. 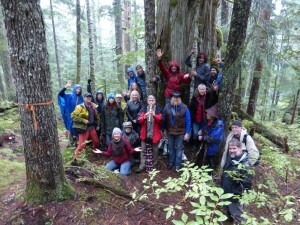 It was recognized by this group, that old-growth contains a complexity of features/values that should gain wider respect. That to ‘destroy’ this complexity for one value only (timber) seems to be short-sighted. It was stated, that from a traditional 1st Nations point-of-view, protection of old forests is also a human rights issue. ELF pointed out that Province states they have met their Old Growth Management Area (OGMA) objectives. Some members pointed out that past targets are one thing, however needs to be scaled up based on new data coming forward in a highly changing environmental context. As Barb stated, one day her culture may have to return to more traditional ways, and that a healthy bear population is thus important to ensure. To have one area specifically set aside for back bear habitat on the Sunshine Coast (or for that matter the whole of B.C.) is an reasonable request and position to hold. The documentary filmmaker will be taking the footage back with her and should have a story completed in the next 8-10 weeks. After extensive logging in Dakota Bowl in the 1980’s and early 90’s, Ministry Forests ordered roads leading to the ‘Dakota Bowl Bear Sanctuary’ to be put ‘to bed’, suggesting that a decision was made at that time to leave this mid-elevation forest alone. Why go back now and destroy the little that is left? Logging these old-growth forests would be a tragic loss to the Sunshine Coast’s forest ecology, bio-diversity values, recreational opportunities and large mammal populations.